Sometimes all you need is a sweet snack to satisfy your dessert cravings. If you’re looking for something healthier, but still want something sweet and satisfying, try one of these popular homemade baked paleo snacks. Gluten-free and nut-free graham crackers can be enjoyed by almost everyone and makes the best sweet paleo snack. 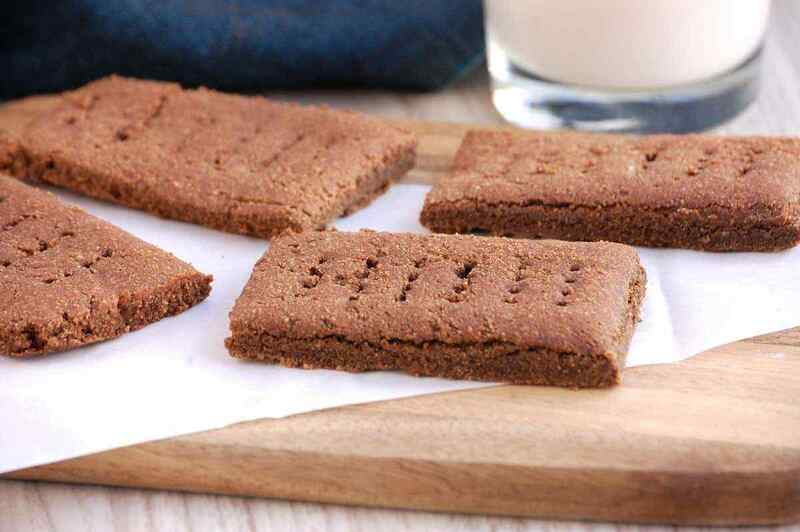 These Paleo chocolate graham crackers are soft and chewy, wonderful with a glass of cold almond milk. The softness or crispiness of the graham crackers is determined by how thinly the dough is rolled out before baking. 1. Preheat the oven to 350 degrees F. Combine the syrup, coconut oil, eggs, and vanilla in a large bowl and mix with a hand blender. Add in the coconut flour, cocoa powder, baking powder, cinnamon, and salt. Blend to combine. Form the dough into a ball and refrigerate for 15 minutes. 2. Remove the dough from the refrigerator and place onto a sheet of parchment paper. Cover with another sheet of parchment paper and roll out the dough into a rectangle about 1/4-inch thick. 3. Transfer the parchment paper with the dough onto a baking sheet. Use a sharp knife to score the dough into squares. Poke each square with a fork. Bake for 8-12 minutes, or until the center is cooked through. Use a spatula to separate the crackers and let cool for one hour. Muffins are suitable for any time of day – morning, afternoon, or night. 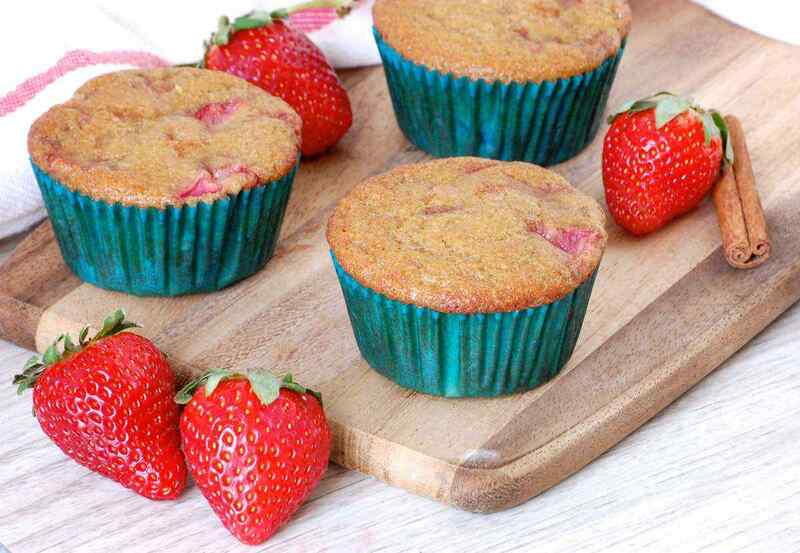 Sweet strawberries are loaded into every bite of these gluten-free, nut-free paleo muffins. Enjoy them warm right out of the oven and do not hesitate to share with family and friends. Fresh strawberries should be used so that the batter does not get too wet. 1. Preheat the oven to 350 degrees F. Line a muffin tin with baking cups. In a large bowl, mix together the maple syrup, coconut oil, eggs, lemon juice, and vanilla. In a separate bowl, stir together the coconut flour, baking soda, cinnamon, and salt. 2. Add the dry ingredients to the wet and stir until combined. Fold in the fresh strawberries. Distribute the batter evenly into 9 muffin cups, filling each about two-thirds of the way full. 3. Bake for 20-25 minutes, or until a toothpick inserted into the center comes out clean and the muffins are no longer wet. Serve warm or store in the refrigerator in an airtight container. These paleo snack bars have all of the flavors of classic oatmeal raisin bars without actually using oatmeal. Almond butter is the secret ingredient that provides bulk to the bars, and cinnamon adds a hint of warm spice. 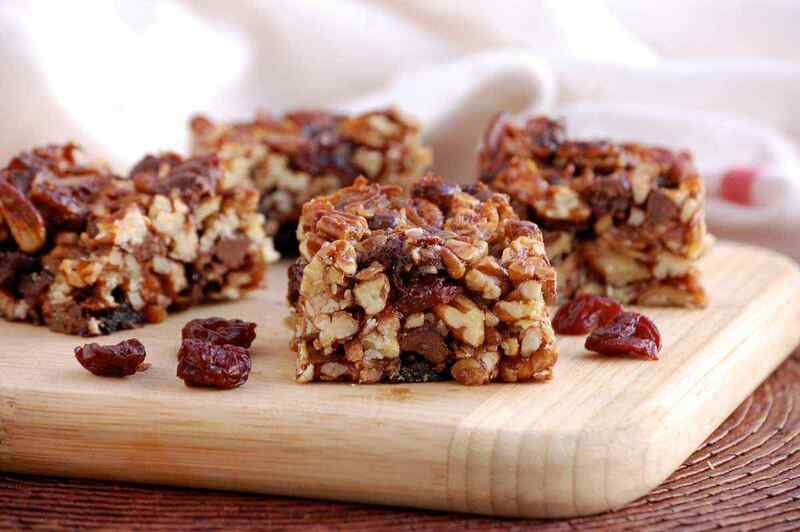 Add as many or few raisins to the light, fluffy bars as you desire. 1. Preheat the oven to 350 degrees F. Grease an 8×8-inch square baking dish with coconut oil spray. In a large bowl, add the almond butter, egg, coconut oil, honey, and vanilla. Use a hand mixer to blend. 2. Add in the coconut flakes, cinnamon, baking soda, and salt. Blend to combine. Fold in the raisins. 3. Transfer the dough to the baking dish and spread out in an even layer. Top with additional raisins if desired. Bake for 20-25 minutes until a toothpick inserted into the center comes out clean. Let cool completely before refrigerating. Serve cold. Sweet and spicy flavors are combined in this tasty bedtime treat. Walnuts and cherries are good for a bedtime snack because they both contain melatonin. The walnut clusters require only a few ingredients and 30 minutes to make. Enjoy a couple of walnut clusters before bed to satisfy a hungry stomach and get a better night’s sleep. 1. Preheat the oven to 300 degrees F. In a large bowl, combine the walnuts, cherries, maple syrup, olive oil, chili powder, and salt. Stir well to coat. 2. Line a baking sheet with parchment paper. 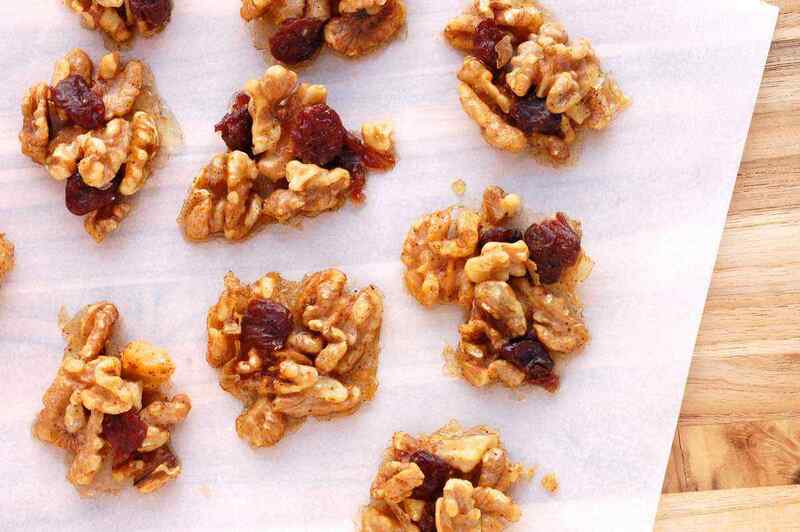 Form the walnuts and cherries into small clusters on the baking sheet. Lightly drizzle each cluster with honey. Bake for 8-10 minutes until golden. Let cool for 15 minutes before serving. Store in the refrigerator. Gluten-free, nut-free cookies such as these are functional for all types of diets. 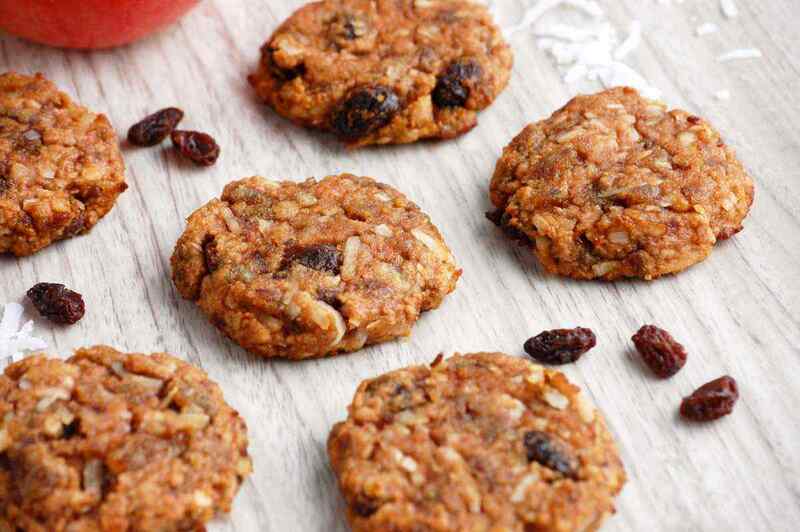 Naturally sweetened with dates and applesauce, these cookies are full of tasty goodness. Coconut flour provides the main base of the recipe, forming soft and chewy cookies that are delicious warm out of the oven. 1. Preheat the oven to 350 degrees F. Place the dates in a food processor and blend until finely chopped. Add the raisins and coconut flakes and pulse 2-3 times to combine. 2. Whisk together the eggs, applesauce, and vanilla in a medium bowl. Add the coconut flour, baking soda, cinnamon, salt, and nutmeg, Stir well to combine. Fold in the raisin mixture. 3. Line a baking sheet with parchment paper. Scoop about a tablespoon of the dough onto the baking sheet and flatten slightly. Bake for 12-15 minutes, or until the cookies are lightly browned. Place on a wire rack to cool before serving. Chewy and crunchy, this baked paleo snack has an explosion of flavors waiting for you. Dark chocolate, tart cherries, and nutty pecans make a delicious combination. Every part of these bars is good for you. Let the nut mixture cool completely before cutting into bars, and store in the refrigerator. 1. Preheat the oven to 300 degrees F. Line an 8×8-inch baking pan with parchment paper. Combine the honey, vanilla, and salt in a medium glass bowl. Microwave for 20-30 seconds or until the honey is fluid. Add the pecans and cherries to the bowl and stir to coat. Let cool for 5 minutes. 2. Stir the chocolate chips into the cooled mixture. Transfer to the baking pan and firmly press into an even layer. Bake for 15-20 minutes, until golden brown. Place on a wire rack to cool for one hour. Remove from the baking pan and cut into bars. Refrigerate until ready to serve. Whether it’s the middle of the morning, late afternoon, or a bedtime snack, these muffins are a great baked paleo snack. 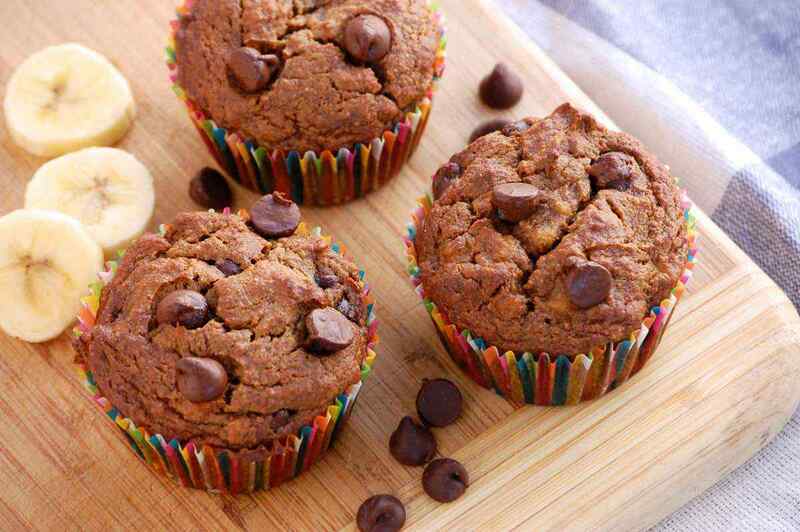 When banana muffins are studded with chocolate chips they become addictive. Try to snack on only one at a time! The more ripe that the bananas are for the recipe, the better. Bake a large batch and keep them in the refrigerator for the rest of the week. 1. Preheat the oven to 350 degrees F. Line a muffin tin with cups. In a large bowl, add the bananas, eggs, almond butter, coconut oil, and vanilla. Use a hand blender to combine. 2. Add in the coconut flour, cinnamon, baking soda, and salt. Blend into the wet mixture, scraping down the sides with a spatula. Fold in the chocolate chips. 3. Distribute the batter evenly into the lined muffin tins, filling each about two-thirds of the way full. Bake for 20-25 minutes, or until a toothpick comes out clean. Serve warm or store in the refrigerator in a resealable bag. Muffins are a tasty treat any time of the day, but these one are especially enjoyable as an indulgence before bed. 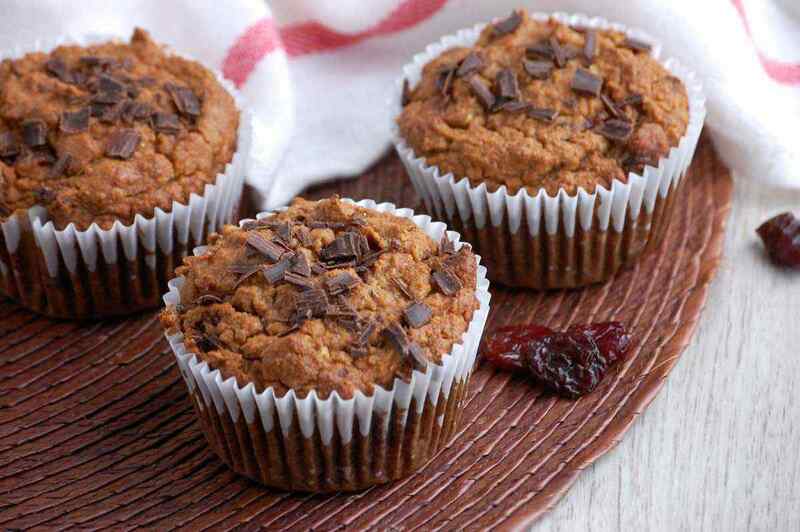 The muffins use the classic combination of chocolate and cherries for sweet, tart flavor. Applesauce and coconut flour are also needed for the base of the muffins. Top the muffins with extra shaved chocolate if desired. 1. Preheat the oven to 350 degrees F. Line a muffin tin with cups. In a large bowl, add the applesauce, eggs, almond butter, coconut oil, and vanilla. Use a hand blender to combine. 2. Add in the coconut flour, baking soda, and salt. Blend into the wet mixture, scraping down the sides with a spatula. Fold in the cherries and chocolate chips. 3. Distribute the batter evenly into the lined muffin tins, filling each about two-thirds of the way full. Bake for 20-25 minutes, or until a toothpick comes out clean. Serve warm topped with shaved chocolate if desired. Store in the refrigerator in an airtight container.